1. Professional Manufacturer for Game Accessories more than 20 years with mature technology, advanced equipment, strict product inspection for the product, our quality is more reliable. 2. Our Product is easy for use. Plug in and power up. Super smart matching system, it can intelligently distinguish different inner management chip from Switch Pro controller and dock, and then output most suitable current. 3. Compatible with Nintendo Pro Controller and Switch Dock, and also supporting TV mode, it can take you more convenient gaming enjoy time. 4. Quick charging, speeding up 40%. 15V - 2.6A output provides enough power when you use it with the dock in TV mode, a great replacement or backup for Nintendo Switch AC adapter. 5.Environmental fireproof material with pure copper in nickel plating cable, it can withstand repeated repeatedly insertion and reverse. Our product charges more effective, more secure and last super life.  MULTIFUNCTIONAL USE - It is not only a great power supply for Nintendo Switch Pro Controller and Dock Station. But also, it support TV mode.  INTELLIGENT CHARGER - This great AC adapter works in high speed and charges the device quickly, and it allows you to recharge while you are enjoying your games.  CONVENIENT REPLACEMENT TRAVEL CHARGER -Plug in, and it power up your Nintendo Switch! 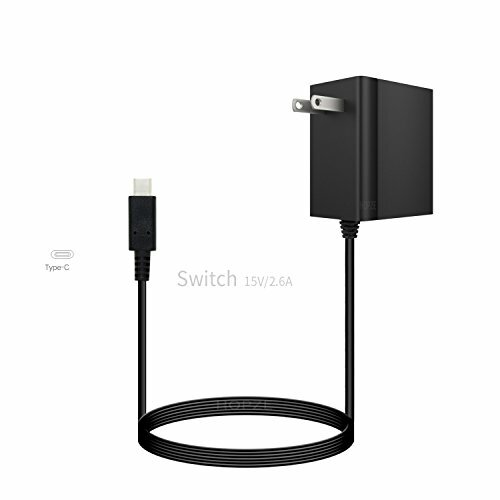 It is in light weight and compatible with both Nintendo Switch dock station and pro controller, it is a good travel charger easily carrying.  UNIVERSAL TYPE C USB CHARGER- Worldwide 110V-240V voltage fit for Nintendo Video Game Type C devices.  GREAT QUALITY - Produced by professional manufacture with more than 20 years. With short circuit protection, over current protection, surge protection, overload protection, over temperature protection, it works reliable and safety. If you have any questions about this product by Hopze, contact us by completing and submitting the form below. If you are looking for a specif part number, please include it with your message. Classic TV Pong Game MiniKit - MK121NTSC by Velleman. A beginner level soldering kit.